When you are selling your home, you want it to sell as quickly as possible. Each day your home is on the market is another day you are responsible for your mortgage payments, not to mention another day of not enjoying life in your new home. Staging your home can give you the push your home needs to sell. Experts estimate that staging your home will help you home sell faster and at an increased price, generally between 10 to 15 percent more. So how do you stage your home? Here are four simple tips to help you stage your home like a pro. The items you remove from your home can easily be moved and stored with a little help from Zippy Shell. We offer moving and storage services within the Greater Columbus area. You can fill up one of our Zippy Shells with all of your stuff, and we’ll take it back to our storage facility until you’re ready to bring them home again. You can play around with the lights in your home to ensure you get the perfect effect for each room. Each room in your home is personalized for the person who lives in the room or the room’s purpose. Although you may find the rooms perfect, the new buyer may have other ideas. In anticipation of selling your home, you should make all of your rooms gender-neutral. 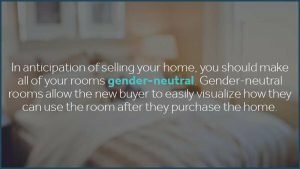 Gender-neutral rooms allow the new buyer to easily visualize how they can use the room after they purchase the home. You can purchase containers to help you store your personal items once you’ve removed them from your rooms. After you deliberately staged your home, it’s time to get opinions from others. If you can rely on your friends and family members to give you unbiased opinions of your staged home, then go for it. However, it’s likely that your friends and family members will cater to you, so you should hire a professional. A real estate professional can give you an honest opinion and provide you with tips on how to improve your efforts. When you are ready to stage your home, give us a call. We are offering 50 percent off content protection and $40 off storage rental when you reserve this month if you mention this blog post! Also in February, if you are paying more than $140/month for storage elsewhere, we will beat your current price by 20 percent and move you free! All you have to do is inquire about our moving services.